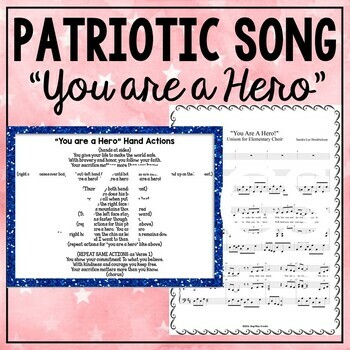 Sing an original patriotic song "You Are a Hero" honoring patriots and heroes using the sing-a-long teaching video, sheet music and lyrics posters. Hand actions, Mp3 Vocal and Accompaniment tracks included. *Please listen to the preview for audio sample. Just think- you won’t have to sync up the power point with the sound files- the videos have lyrics, vocal and karaoke tracks to make your teaching job easier. 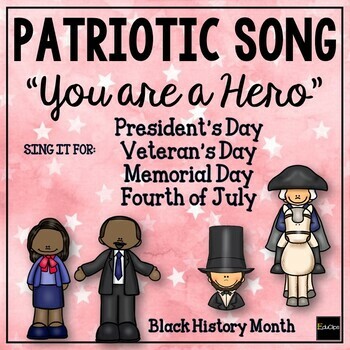 “You Are A Hero” is a patriotic song about thanking and honoring our heroes. The vocal track is sung by an adult female. 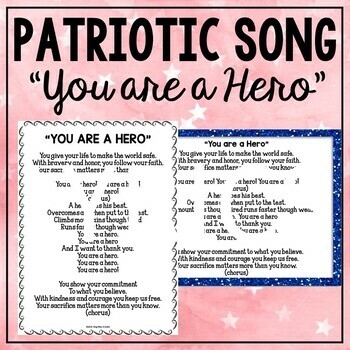 The song is in unison and appropriate for grades 3 and up. Please listen to the sound file in the preview download. 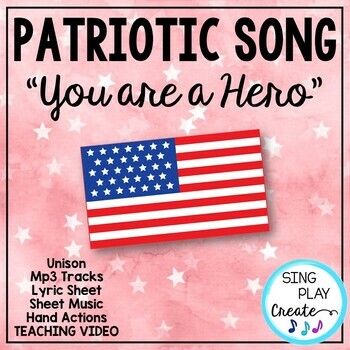 Patriotic Song "I Love America"
ABOUT SING PLAY CREATE LLC. All products and works are copyrighted by Sing Play Create LLC. Buyers may get Free store credit by going to "my purchases" and click on "Provide Feedback". Ratings and helpful feedback are welcomed.